If you've tapas-barred your way through Spain, surely you've noticed the most recurring tapas item: what the Spaniards call "tortilla." It is almost certainly at every tapas bar in Spain, sitting high, proud, and room temperature on the counter. Of course, the name is a confusion to us Americans raised on Mexican food. Tortilla? Is it made with corn or wheat? Neither! And it looks nothing like a Mexican tortilla. 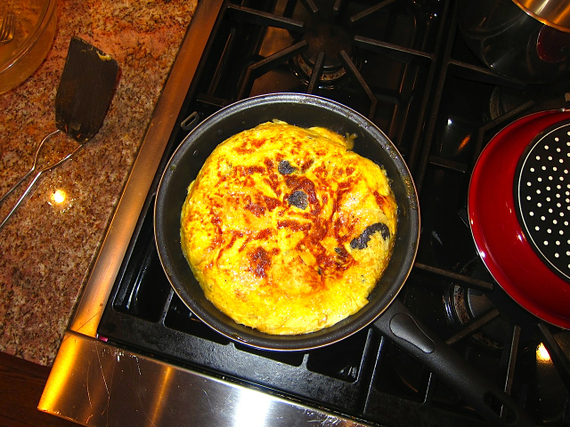 A Spanish tortilla is actually a kind of frittata. 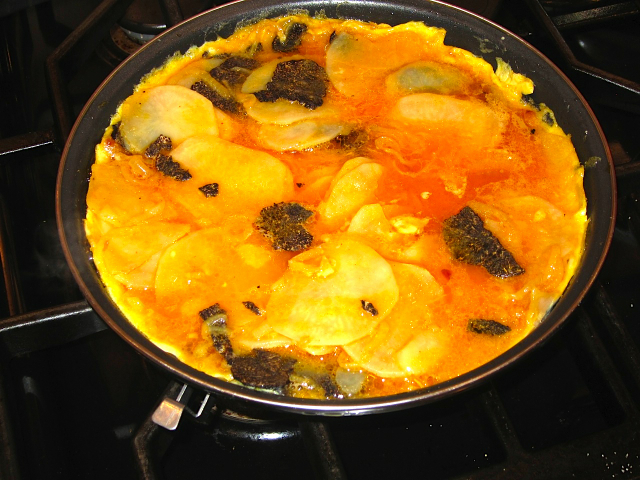 It is made, in a sauté pan, with thin slices of potatoes, thin slices of onions, and a lot of eggs. When it's golden-brown on both sides, the tortilla goes on to a plate -- where it is kept at room temperature, and, finally, sliced into triangular wedges (just like a pizza). It is delicious beyond description. But when I was contemplating making a tortilla for a tapas party -- just this week -- I realized what season we were in. Winter! And December to March is the time for the great black truffles of France. Why did my brain reach across the border? Because I intuited that the earthy flavor of black truffle, and the earthy flavors of egg and potato, would be magnificent together. I've never seen this done before, nor do I believe anyone ever has done it before. But creativity is not always a bad thing! These flavors went together as if they had been ordained to do so by some border-straddling Spanish-French chef. The only problem is dinero. Not Robert. Dollars. Two hundred of them (or a little less) for two ounces of fresh black truffle. Though you may be reluctant, you can find it on the Internet. 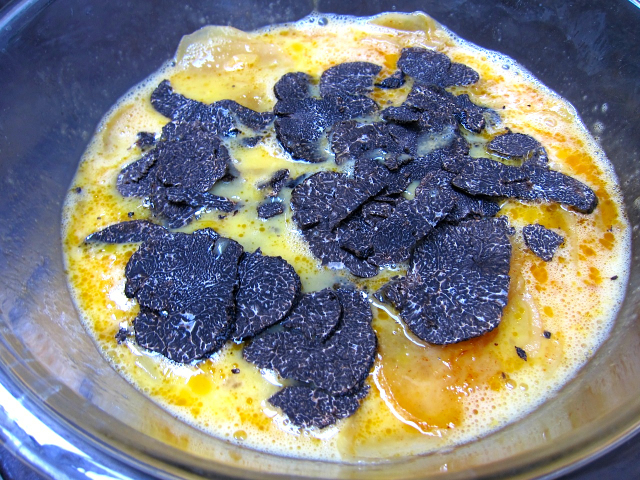 Feel free to make the following recipe without the black truffle horning its way in... but I guarantee you will beam at the new dimension black truffle brings to this old dish. And there's one more purchase you might want to consider before proceeding. The hardest part of making a tortilla is flipping it. After the eggs and potatoes cook together in the skillet for a few minutes, you need to turn the tortilla... even though it's a little messy and undercooked at this point. Traditionally, you slide it out of the pan onto a plate, invert tortilla onto another plate, then slide the tortilla back into the skillet. Lots of work and risk. However... if you search the Internet for a special tortilla pan from Spain from a a company called Magefesa... you will experience a miracle. 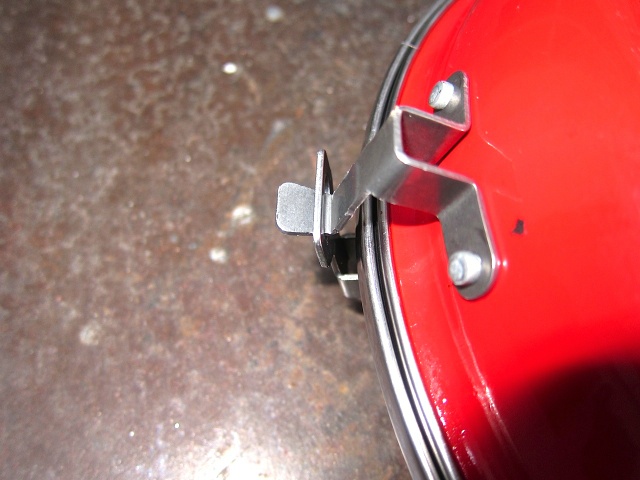 The tortilla is actually two pans, with a hook to connect them. 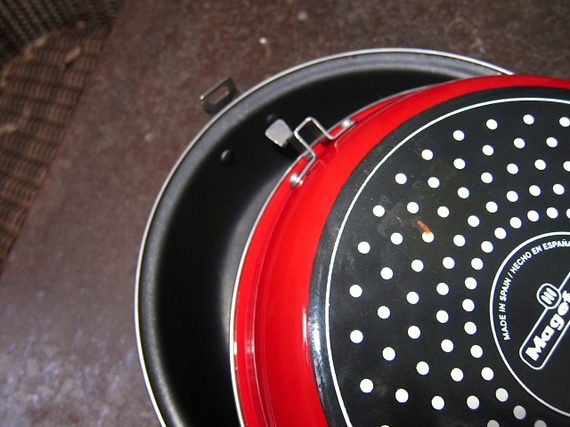 When the tortilla is ready to flip, you simply engage the hook and, with a quick movement, flip the pan. Then you're ready to keep on cookin'. 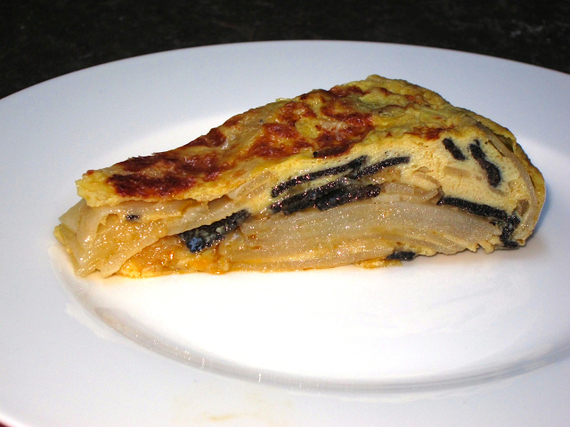 There is no dish that is more widely seen on tapas bars throughout Spain, or more revered, than this wonderful potato-and-egg pie. Remember: This is not an omelet, though you want it to be a little moist inside. It's more like a frittata. Think "potato bound by tender egg." The following version is the classic tortilla, save for one tweak: the addition of thin slices of fresh black truffle, which adds a wonderfully complementary flavor. 1. Add three tablespoons of the olive oil, the onion and paprika to an 8"or 9" non-stick skillet and place over medium heat. Cook gently for 4 minutes without coloring the onion, stirring occasionally. 2. Add the remaining oil and let it warm up. Meanwhile, slice the potatoes crosswise, into very thin slices, a bit less than 1/8" thick. 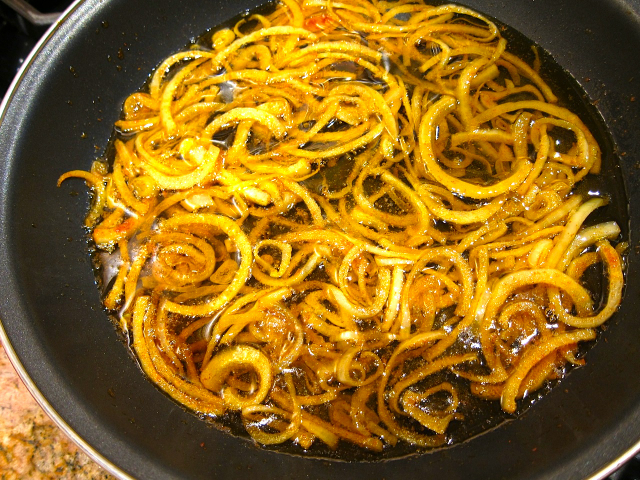 Add them to the onion and oil mixture in handfuls, spreading out each addition and sprinkling them with salt as you go. 3. For the next 20 minutes, or until they are just tender, "stew" the potatoes over medium-low heat, gently stirring them to both separate the slices and to bathe them in the flavored oil. You don't want them to brown, so regulate the heat as necessary. 4. 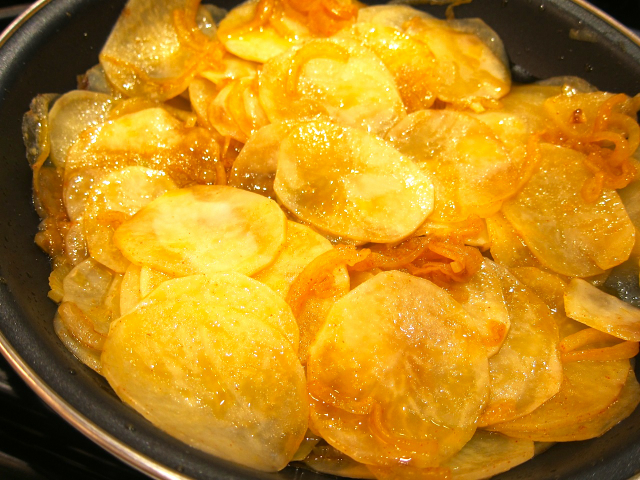 When the potatoes are just tender, remove the pan from the heat and allow them to cool in the oil for 4-5 minutes. 5. In a large bowl, beat the eggs with the sugar and a pinch of salt. 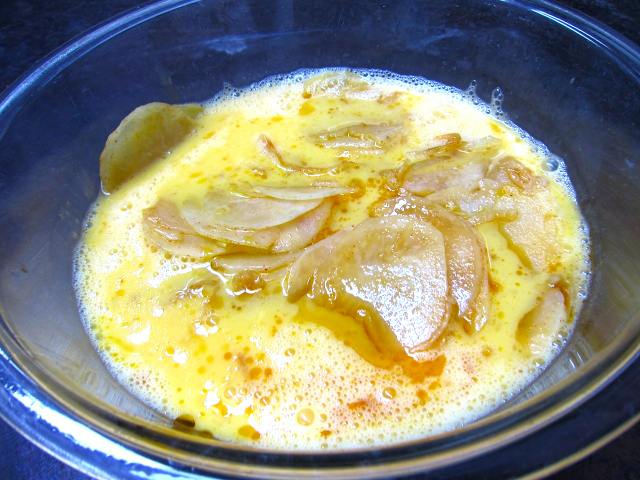 Using a slotted spoon, transfer the still warm potatoes to the bowl of eggs, add the black truffle slices, combine thoroughly, and let the mixture rest for 10 minutes. 6. Drain oil from skillet (reserve most of the oil for another use), wipe the skillet clean, and return 2 tablespoons of the reserved oil to the skillet. 7. Place the skillet over medium-high heat until hot but not smoking. Add the egg, potato and truffle mixture, shaking and swirling the skillet for about 25 seconds to help re-heat the eggs. 8. Reduce the heat to medium, distribute the potatoes and truffles evenly in the skillet and cook until the bottom is light golden in color, about 2 1/2 minutes. 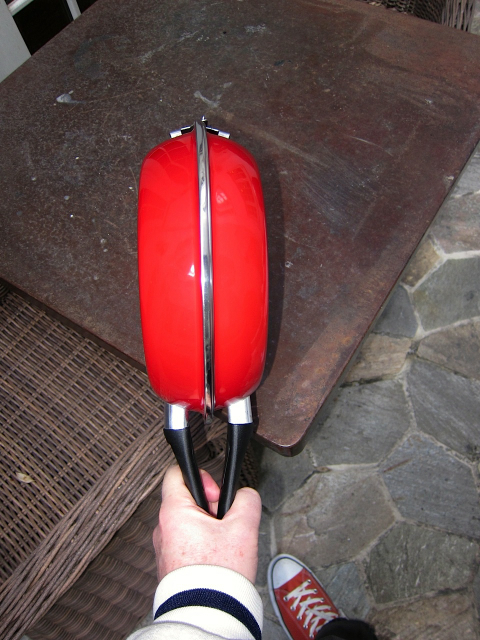 Then, if using the Magefesa, simply flip over. If not, remove the skillet from the heat and invert a large plate over the tortilla. Then, in one quick motion, turn the plate and skillet over so that the tortilla falls on the plate. Very quickly return the tortilla to the skillet and continue to cook over medium heat, until the eggs are just set in the middle but still moist, about 3 minutes more. 9. When done, remove to a plate. Let tortilla come to room temperature. To serve, either cut into wedges, or make diagonal cross-cuts so that many mouthful-size bites are created; if going the latter route, stick toothpicks into each mouthful-size bite.